I may have predicted that Lincoln would win Best Picture, but I am glad that Argo won. It truly was a more gripping film and deserved all the acclaim it has gotten throughout the award season. 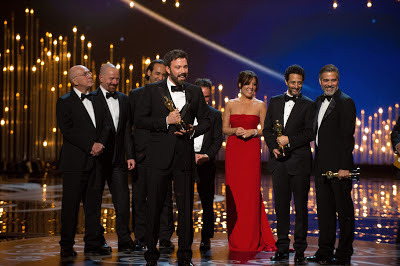 And while on that, I personally found Ben Affleck’s speech while accepting the prize to be one of the best of the night, because of its simplicity. I always wondered why so many award winners racked their brains to remember all the names of people they had to thank and that it would be so simple to just say thank you to everyone involved with the film, because even if all the important people were thanked, there are always so many people who deserve to be thanked. And Affleck did just that! And it didn’t come from being lazy or not being bothered; it was heartfelt and sincere. Adding to that, it was endearing when he spoke of how he’d never imagined being up there again after winning all those years ago. 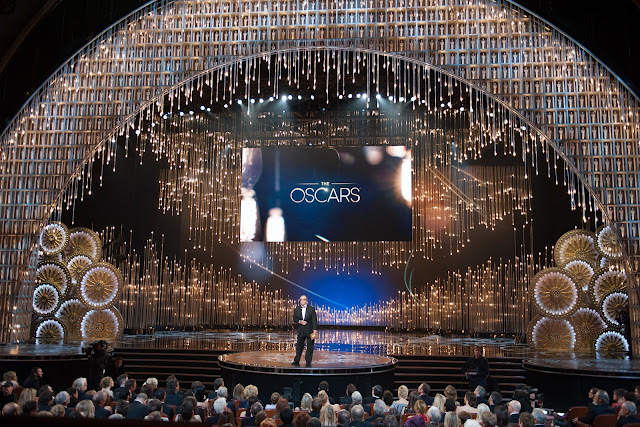 And Argo also made Oscar history in a special way, being only the fourth film ever to have won Best Picture without even a nomination for directing—something that last happened twenty-three years ago. Among other speeches that really impressed me was Quentin Tarantino’s, because he made a strong point about creating memorable characters, finding a really impactful way of thanking the actors who make the characters memorable. Anne Hathaway’s speech ended beautifully, with her hope that stories like Fontine’s would one day just be stories and not a reality. Adele’s speech was sincere as well, and simple. She maybe one of the most celebrated contemporary musicians, but it’s nice to see that winning an Oscar is still a big deal for her. And speaking of Adele, her performance of the Oscar-winning ‘Skyfall’ was one of the best performances of the evening. 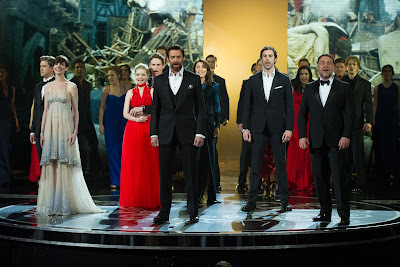 However, my favorite was the performance by the cast of Les Misérables. The impact that it made, with all the big names together on the stage, singing a song that was truly the soul of such an epic film, was magnificent and exactly what an Oscar night performance should be. Some say that it was lip-synced, but going by the close-up shots of the actors while they sang, it sure did look like they were giving it their all, right there and then. Among other performances, I enjoyed Catherine Zeta Jones’, even though it had a lot less energy than she put into the performance of ‘All That Jazz’ in the film itself. I actually liked Jennifer Hudson’s performance at this Oscars better than hers in the film, where I thought she had overacted. 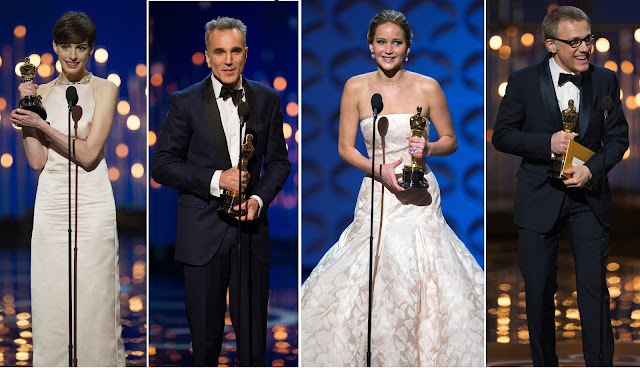 Moving on to the awards… Daniel Day-Lewis and Anne Hathaway winning surely was no surprise. In screenplay, Django Unchained was a good choice, and when Argo took the Oscar for adapted screenplay, I could just imagine it inching closer to the Best Picture prize, overtaking Lincoln in the process. And when Ang Lee won for Life Of Pi, Argo’s win was certain. And given how close the race was this year, while Ang Lee’s win was well-deserved, it did take me by surprise. As did Jennifer Lawrence’s…I thought Emmanuelle Riva’s was a stronger performance, even though Lawrence was excellent, and I’m happy that she won. Life Of Pi turned out to be a big winner (with a total of four Oscars), which came as no surprise to me, with its wins in categories like cinematography and visual effects being definite all along. Les Misérables also deserved its three wins, including sound mixing and make-up and hairstyling. Clearly, I expected Lincoln to win more than one Oscar other than best lead actor, but a win for production design was expected for sure. Argo took away two other than Best Picture, both of which were quite big wins. 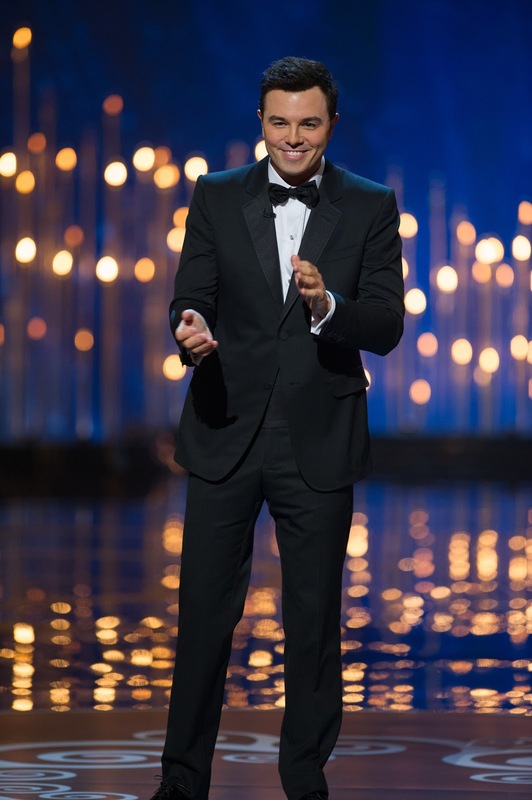 As a show, the Oscars this year were very entertaining, I would say. 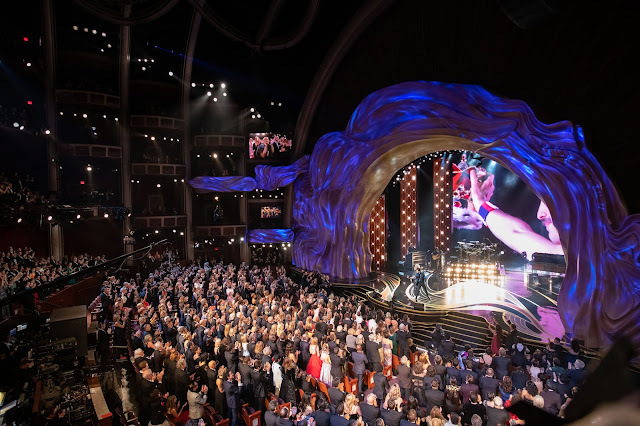 The Academy has tried hard to get a fresher appeal in recent years, though daring and younger hosts (having only been successful with Hugh Jackman four years ago). However, this year, they got just what they needed. I’m sure host Seth MacFarlane wasn’t everyone’s cup of tea, but he sure did grab everyone’s attention. He made some distasteful jokes for sure, like perhaps the dig at Rihanna and Chris Brown. He even hit below the belt (and not in a funny-deprecating way), when he joked about Jean Dujardin’s career. And he even hit a sensitive spot when he said that the actor that truly got into Abraham Lincoln’s head was John Wilkes Booth. But I thought that his comeback after the audience reacted unfavorably was excellent! “One hundred and fifty years, and it’s still too soon? !” A few obvious jokes, like saying that Meryl Streep needed no introduction, and then actually not giving her an introduction, were still funny, I thought. What did get annoying was when he was talking to the teleprompter like he was checking with someone whether he should seriously make a certain joke at some point. Also, he could have controlled his laughter a little in the middle of a joke. Although, some might’ve enjoyed how casual and relaxed that made the show. I truly enjoyed it—from the dance routines in the beginning, to the all the subtle and not-so-subtle references to things. I especially liked the reference to The Sound Of Music, when MacFarlane called on ‘the Von Trapp family singers’ before calling presenter Christopher Plummer to present. In a show where they were only paying tribute to contemporary musicals, I thought that was nice way to bring in a little something to remember one of the classic musicals of all time. The presenters were also effective and varied, with even the big surprise of Michelle Obama being among them. It surely was an evening full of entertainment, with a fair mix of Oscar recognition. I enjoyed the show!